Yep. It's official. I fried my laptop keyboard with coffee :( But I did learn a valuable lesson, and that is that I should not attempt to do anything that requires balance or coordination before I have a full cup of coffee in my system. So.....you know what that means? Probably not a ton of blogging from me until I get it returned from being repaired. I do have my husband's laptop to use to get online (thankfully!) but he uses it a lot for work & I don't to have him fighting me for it. I also don't want to have to upload all of my pictures onto his computer & clutter up all of his tattoo & guitar stuff with sewing & DIY stuff. I mean I do, but I doubt he wants me to. So I will try to do a few quick posts here or there when I can but don't count on anything too fun or fancy for a little bit. Hopefully they return it to me quickly & I don't lose everything in the process. It's been a crazy 10 days or so in my house. First of all, I've been plagued by migraines a lot lately. It's been making it really hard to get anything done because there are days where it's been so bad that I've been throwing up & can hardly get off the couch. No fun at all. I inherit this from my mother I think. Feel very bad for us! We had a good old backyard birthday party at our house and it was a huge hit with the kids. My friend let me borrow a little bouncy house so the kids were super happy. The bouncy house was definitely the kids' favorite thing about the party, plus we have a great backyard so they were definitely running off some of that crazy energy they have (where do they get that much energy?!) I think in total we had about 10 kids here, and while it was crazy, it was a great day and my little man felt extremely special and loved by everyone. Here's some of his little buddies on the swing set. Lillers & her bff Haya. The ever popular bouncy house. This thing was awesome! The boys took turns being Optimus Prime. He looked kind of funny swinging. Present time! Man it was hard trying to get them all to sit in a circle. One of many action figures he got. Posing with all of his buddies & his new Xbox 360 from Mommy & Daddy! Lucky boy. Lily asked me to take a picture of her with her new Ariel headband. Always posing for the camera! My happy boy after the party was over. Me & Lily hung out in the bouncy house together for a bit after the stinky boys left. Ayden was very lucky to have his cousin Kelsie here to so lovingly help put his new Lego Harry Potter set together. He loves Lego Harry Potter! The only thing I totally forgot to take pictures of were his cupcakes. I completely spaced it. I'm hoping Shayne's sister got a couple pictures of them because they turned out pretty cute if I do say so myself! Ok, my next project I've decided is going to be my buffet table. Remember this thing that I got for free? What color should I paint it?????? 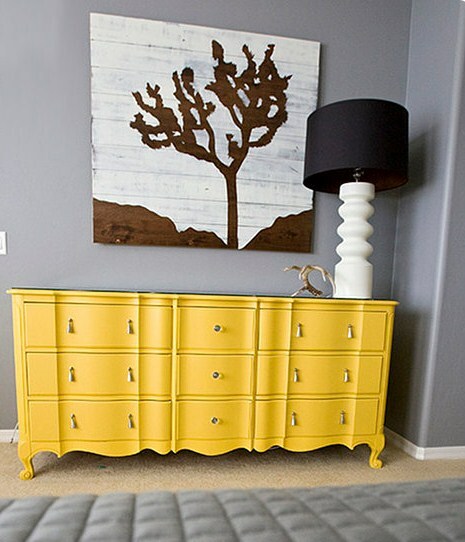 I have a huge phobia of color in my house. I have a ton of black. A lot of grey. A lot of white. I have little touches of color around the house but I don't have any pieces of furniture in color & I would really like to change that. But I just can't make a decision & I'm too afraid of....well, I don't know what I'm afraid of. What do you think? Help me pick a color so I can begin! So is everyone back to school now? It's so weird to me that I have a child in school full time and that we actually have a "back to school" season. It's a very odd feeling when you go from having babies and toddlers who are at home all the time to suddenly having to send your child off to school for almost 40 hours a week. First of all, I can't believe that I'm old enough to have a first grader, and secondly, where the heck did the time go? Ayden will be 7 this Friday! I have a seven year old. Insane. One thing that is great about this school thing is that I now have tons of time to spend one on one with my little Lily. For the last 3 1/2 years I've had to split my time with the kids & try to find time to be with them each one on one. Well, now that big brother is at school me & Lily have Girl's Day every day. We get to hang out together all day just the two of us and she loves it. We play "work" where Lily pretends that she works at Macy's (I used to work in cosmetics there) and we play makeup, do our nails, and take turns being the ma'am (the customer) and the worker. She loves it. She also just told me that she wants to play sewing just like Mommy, so I'm going to have to get her a little girl's sewing kit that she can play with while I sew & quilt. Until I get my sewing stuff unpacked & set up I'm trying to find cute little crafts that I can do with her to make her feel like she's a big girl & that we can do on our Girls Day. So we looked online (love Pinterest!) and found tons of things that she liked that we could make to beautify her bedroom, and then headed out to get our supplies. Here's our supplies. The ugly vase I already had (garage sale! ), the spray paint I already had, and then we bought some Styrofoam balls, crepe paper, and tissue paper for our little crafty party. I started off by cleaning the vase & giving it a couple coats of the Krylon Matte Aluminum spray paint. I absolutely love this color. It's so pretty and it covers so well. For the rosettes I started by cutting a strip of crepe paper (maybe 20-25 inches- I didn't measure) and then I crumpled it up really well to kind of soften it & make it flexible. Then I started rolling it up & twisting the bottom to make a stem to hold on to. Then I started wrapping and twisting the paper around. Keep twisting & wrapping and it will start to take form. In the beginning it doesn't really look like much, but keep going! It takes some practice but you'll figure it out after you make a couple of them. Just keep twisting and wrapping and when you get to the end of your strip of crepe paper you'll have a cute little rosette! Use a dab of hot glue to secure the end of the paper and voila! A rosette! Again, it takes some practice. The first few I made looked pretty crappy & sad but then I got better. Pretty cute huh? Mine didn't turn out exactly like the gorgeous ones from The Idea Room, but mine looked ok to me. Everyone's rosettes are going to look slightly different & you can manipulate them & fluff them up or squish them down until you get them to look exactly how you want them to. When I was done gluing them on I just took my little rosette ball & set it on the vase. This is where it went in Lily's room She has a "special" shelf in her room where she has things that she loves. It's nothing too fancy...just a few pictures, an Ariel birthday card, a little jewelry box, her pink piggy bank, and a few other things that she's collected. It fits perfectly on the shelf & looks so cute. The little lady loves it. When I showed her its spot on her shelf she gasped & said "It's so beautiful! Thank you!" I'd say mission accomplished. 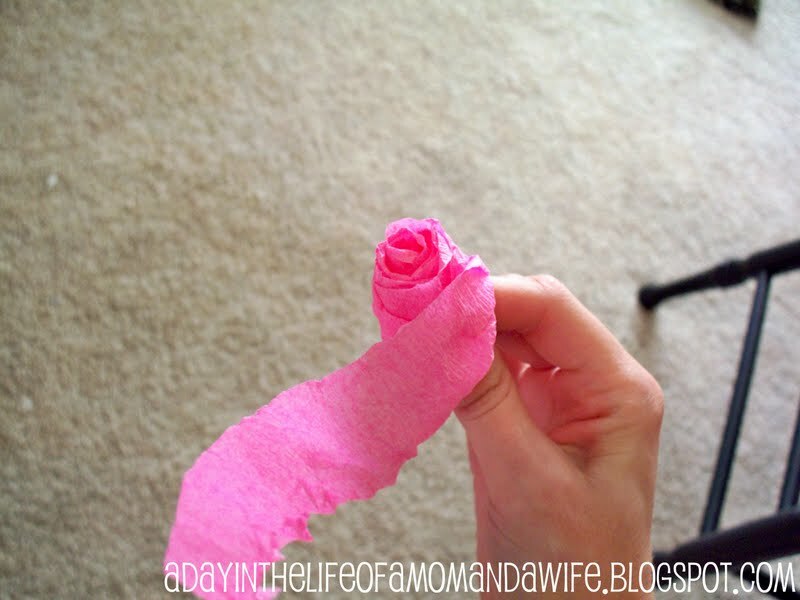 The other craft we made were the tissue paper flowers that you might have seen everywhere. They hang from the ceiling & look adorable in little girls' rooms or can be used as decorations for a baby shower, birthday party, bridal shower, etc. These were really quick and easy and they turned out perfectly. Lily loves them and I hung them right above her bed so she can look at them when she goes to sleep. I think I'm going to end up making a few more, but at this point I was all crafted out & Ayden was home from school. I decided that my next project will have to be a new quilt for Lily's bed. I made her two quilts last year and they are super cute, but she has a bigger bed now & the quilts look teeny tiny on her new big girl bed. Not sure what colors I'm going to do (I'm sure it will involve pink, obviously) but I think I'm going to go for a more "elegant" look as opposed to just all pink & super girly like everything she already has. Also, Ayden's birthday party is next weekend so I have to figure out what he wants his theme to be. I'm hoping I can just go the lazy route and buy all of the matching party decor (I know I know, store bought decorations! The horror). I think I'm probably going to end up making cupcakes like I did last year but I kind of want to attempt a cool tiered layered cake. Not sure yet so I guess we'll see how I feel when it gets closer. I'll also have family in town too so if it gets too crazy busy then I'll probably just do cupcakes. The big tiered cake would be so fun though don't you think?! Enjoy these last few weeks of sunshine & warm weather! Are you ready for Fall? I am, just because I want to wear my cute boots but figured it was probably a bad idea today in our 95 degree weather we're still having. Come on fall! That's right! I'm bringing Must-Have Mondays back...finally. I don't remember why I stopped doing them actually. I think one of the Mondays fell on a holiday, and then I was busy the next week, and then I just forgot because I wasn't in the routine of doing it anymore. Whatever it was I'm just glad they are back! I love sharing my must-have items with you and hearing what you think of them or what you recommend as well. So here we go. 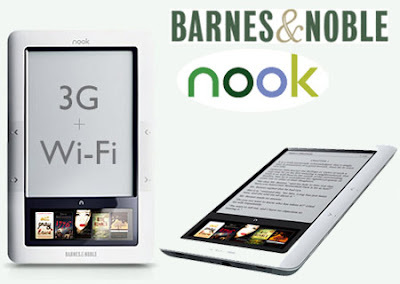 The Barnes and Noble Nook Color! Or if you're like me & got the original Nook before they even made the Nook Color, yours might look less fancy but still great to read books on. I was a little sad that just a few months after my wonderful husband bought me my Nook as an early Christmas present last year they decided to come out with the Nook Color, which kind of works more like an iPad with it's full touch screen & ability to show in color (hence the name). Mine is the original Nook & I love it. I can read books, magazines, and newspapers on it, as well as surf the web & play games too. The only downside is when I read magazines I can't really see the pictures that well because it's only in B&W and it shows the pictures really small. But that's ok with me because I mostly just use it for books. 1. I can get new books way faster. No more driving to the bookstore to get that new hot book I've been waiting for. On the day that it comes out (or on the day I decide to start reading it) all I have to do is find it on my Nook, buy it, and start reading. It takes about 60 seconds and I don't even have to put on makeup, load 2 kids into the car, and navigate a quiet book store with them. 2. It's cheaper than buying real books. I've heard people complain that E-Books are too expensive and I beg to differ. So far, every book that I've bought & downloaded on mine has been less expensive than if I bought an actual book. When a new book comes out it's usually just in hardback first, and hardbacks can be spendy! The last one I bought was like $18.99. I read it in 2 days. I checked the price on my Nook and it was only $10.99. Much more reasonable! Maybe it's not always cheaper, but it's pretty dang close most of the time. And if it is like a dollar more than an actual book I think I'd just rather pay up than to go to the bookstore and buy it. Time is money people! And you can't put a price on the convenience. 3. The Lend Me feature. One thing I love about real books is the fact that I can lend them out to everyone. People are always borrowing books from me and I love it. I love that they don't have to go out and spend a fortune on them when I already have (LOL) and I love introducing people to good books and series that I love. 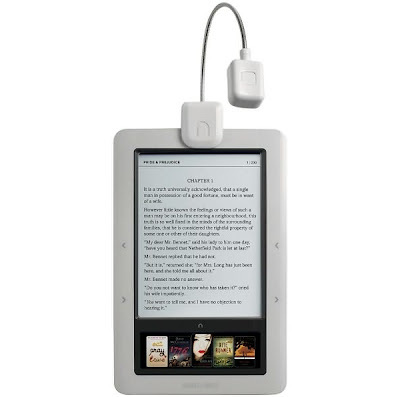 With the Nook you can loan other Nook users some of the books that you have bought for up to 10 days. I say some books because not all books have the Lend Me feature, but a lot of them do. All you have to do is type in the recipient's email address that is linked to their B&N Nook account and it will automatically show up on their Nook & they can read it pretty much right away! They can have it for up to 10 days and then it automatically comes back to you, so you don't have to worry about lending it and never seeing it again like you do with real books. (I've had that happen a few times-sad!) If you're like me & don't have a ton of friends with a Nook you can find groups on Facebook & other websites where people with Nooks will post lists of books they own & want to borrow & you can just swap email addresses with them to get some of the books you want. You can also check out your local library and download E-books from them. Look into that. Just remember that when you are lending out a Nook book you can't read it on your Nook until you get it back, much like a regular book. 4. It holds so many books! If you are traveling, going on vacation, laying out on the beach,or even heading to a doctor's appointment or something you can just throw the Nook in your purse & know that you have tons of reading material with you when you need it. You don't have to have a big bulky book (or books) with you and you don't have to worry about bookmarks. Or kids pulling your bookmarks out like mine. The Nook automatically saves your place in multiple books at the same time so when you go back to the book it starts right where you left off. Neat! A little clip on Nook lamp! That would be perfect & would allow me to read until the wee hours of the early early morning while my husband snoozes away. I do this often & usually regret it the next day. There are many other good things about the Nook too, but those are the main ones that I covered. You can read more about them HERE. Please note: Barnes and Noble is in no way a sponsor of my blog or me, though I wish they were. I was not paid to promote this product, it's simply my own opinion of a great item that I love & want to share with you guys! I'd love a free Nook Color though, hehe. I don't know how the Nook compares to Amazon's Kindle or any of the other E-Readers. They all have their pros and cons and like any big ticket item or electronic device that you're going to buy you need to do your homework and compare them to see which one sounds best for you. Some people are die hard Kindle lovers, others will say just get an iPad (I wish! Yeah, that's a tad out of my price range right now!) but for me the Nook is just perfect. It does everything I need it to & more & I use it all the time. My husband even uses it now too (when he can peel it out of my hands) and said he might get his own. I'm trying to talk him into getting the color one & then he can have my old one...I'll let you know how that one goes! I'd love to hear your feedback. 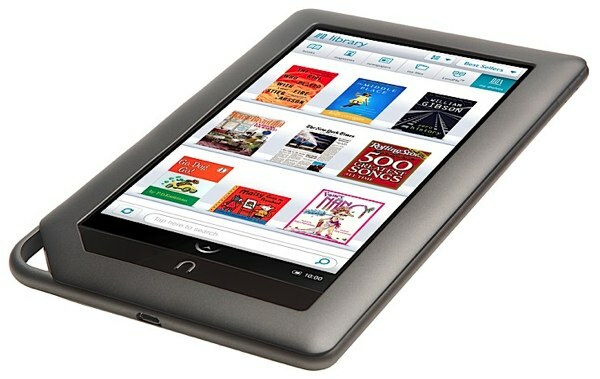 What do you think of the Nook or the other E-Readers? Do you have one? Do you want to get one? Do you think they are a waste of time or money, or are you just a real book lover & can't part with the smell of a nice new paper book? Either way, let me know! I'd love to hear about it.